JACKSONVILLE, Fla. - Students at a Jacksonville private school are receiving mentorship in archery from a Paralympian gold medalist. 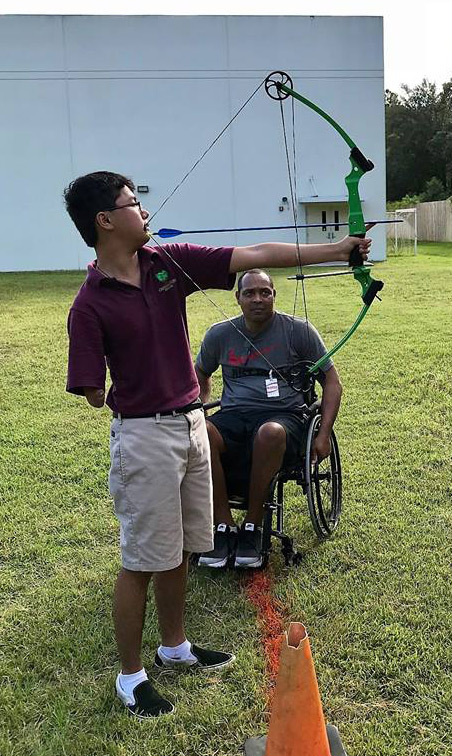 Paralympic archery gold medalist Andre Shelby not only gives students advice on archery, but helped one student with one arm learn how to adapt and shoot a bow and arrow with the help of his mouth. The Greenwood School prides itself on bringing out students' strengths and overcoming weaknesses. In the last few years, archery was introduced as an after-school activity and an enrichment course for middle school students. TJ Eldridge may only have one arm, but he didn’t shy away from the opportunity. Instead, he got creative with Shelby's help. "We have a lot of people on our team that are mouth-type shooters who are amputees. We have so many adaptive ways of shooting, just to let him do that and, his first time, he really enjoys it," Shelby said. "I told him, 'I really think you’re pretty good. If you ever decide to go any further, let me know." Dr. Anthony Mortimer, head of Greenwood School, told News4Jax that the students truly enjoy archery and their time with Shelby. He said that the sport and mentorship helps build their self-awareness and confidence while on the archery field behind the school. "It's just the calm -- that Zen moment the ability to focus on something that they can individually thrive on enjoy have a break from academics," Mortimer said. Shelby works with the students at least once a month. He said people encouraged him to never give up and he wants to do the same for these students. "To know that things are possible even if you have any accidents, tragedies, any misfortunes in your life," Shelby said. "There’s always a different way of doing things that might take us a little longer, but we can still do it just as good as anybody else." Those are words the students can keep with them not just on the archery field, but throughout life.